Chamaecyparis lawsoniana 'Filip's Golden Tears' is a fantastic new selection of Port Orford Cedar. The tree's overall form is upright with all lateral branches strictly weeping; the branchlets are golden yellow, arranged in a delicate lacy pattern, typical of the species. Despite the golden foliage, 'Filip's Golden Tears will not burn in full sun. 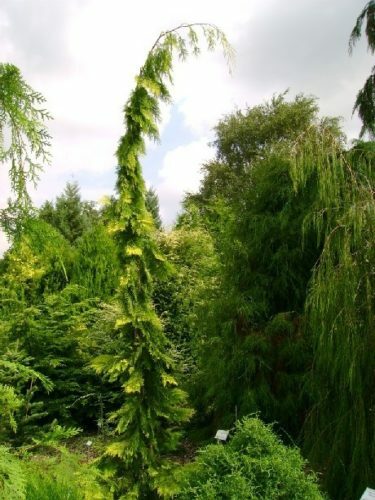 After 10 years of growth, mature specimen will measure 20 feet (6 m) tall and 5 feet (1.5 m) wide, an annual growth rate of up to 24 inches (70 cm), creating a narrow exclamation point in the landscape. Edwin Smits of Volkel, The Netherlands, developed this fine cultivar in 1996 through crossing Chamaecyparis lawsoniana 'Dik's Weeping' and 'Stewartii' He then named and registered the results 2008. It should be noted that Chamaecyparis lawsoniana 'Filip's Tearfull' is a sister seedling from 'Filip's Golden Tears' from the same seed lot. Chamaecyparis lawsoniana 'Filip's Golden Tears' in a nursery display garden in The Netherlands.